Half-length portrait of Sir John Pringle wearing a grey curled wig, his body turned the viewer’s left. Pringle wears a purple coat and waistcoat, each with gold buttons, a white neck-cloth and over these, a black robe. 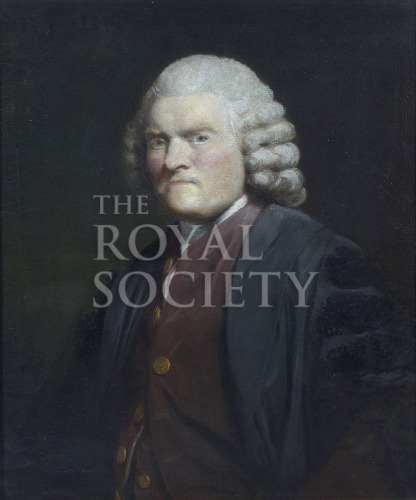 Pringle was elected a Fellow of the Royal Society in 1745, he served as its President from 1772 to 1778. Presented by Sir John Pringle FRS, 1778. The (apparently reluctant) commissioning of the work is referred to in the Society’s Council Minutes: “The Council requested of the President that he would favour them with his picture. The President [deleted text – replied that the hopes of presenting his Picture to the Society at the request of their Council was too great for him] returned thanks to the Council for the honour done to him but added that he would not allow any expense to be incurred upon that account by the Society, & that he intended to present it himself. Ordered that the like request be made to Sir James Burrow...” [Royal Society Council Minutes, Original, CMO/6, meeting of 19 June 1777, p.317].